Handmade Ancient Egyptian Khopesh Sword of Pharaoh. See Pictures, Prices, and Descriptions. Made by Scorpion Swords & Knives. 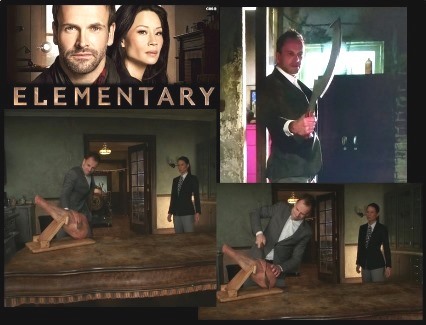 Our Khopesh was on the hit CBS show Elementary. Episode 10 of Season 6, called “The Adventure of the Ersatz Sobekneferu”. Order from here to get your own copy of this ancient Egyptian sword. While originally these ancient swords were used against the Egyptians, they were so impressed by them that they adopted them as their own and the Khopesh eventually became the very symbol of Egyptian authority, with two such swords even found in the tomb of the legendary Pharaoh/Mummy Tutankhamun (c 1350 BC). Handle: Zebra wood. Scales attached with hidden pins & glued.